Military-style modular weapons systems filled the convention floor this year at SHOT Show 2016. One of those guns is the M400 Predator by SIG Sauer. This 5.56 has a heavy stainless steel barrel with a free floating ALG hand guard and a basic direct impingement gas system, which using high-pressure gas acting directly on the bolt and carrier, helping to save weight and lower costs. This year the gun has been updated to include a 6-position collapsible stock and a new ALG hand guard with M-locks for attachments on the rail. 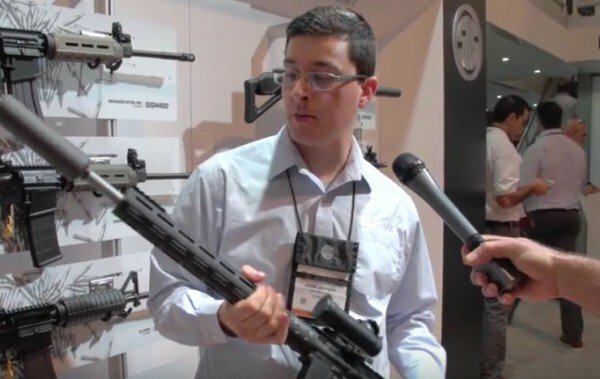 We spoke with Adam Johnson about the gun in Las Vegas at the 2016 SHOT Show. While this gun is great for law enforcement and military applications, it’s also a great weapon for hunting. Especially valuable for accurate long-range shooting in the gun’s extended barrel at 20 inches, roughly two inches more than other ARs on the market. In addition to mounting a scope after market, buyers can also equip this gun with a silencer thanks to threaded muzzle. This helps to reduce recoil, improves accuracy and saves eardrums.